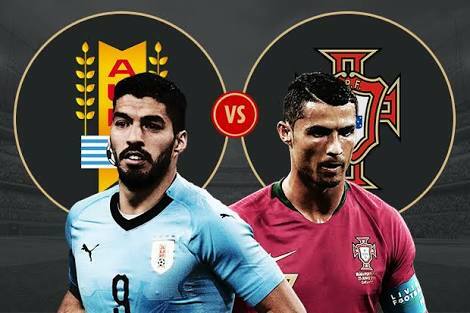 Uruguay will take on Portugal in the round of 16 on Saturday night. The South Americans finished top of Group A following a 3-0 win over hosts Russia on Monday. Uruguay coach, Oscar Tabarez has no new injuries worries in his squad ahead of this clash. Tabarez is set to make changes again with Sebastian Coates making way for Martin Caceres, Carlos Sanchez replaces Nahitan Nandez in the midfield and Diego Laxalt is on bench, with Jose Gimenez coming back into the starting XI. Uruguay have the deadly attacking duo of Edinson Cavani and Luis Suarez, who have three goals between them. Uruguay were semi-finalists in South Africa back in 2010. Meanwhile, Portugal head into this game after captain Cristiano Ronaldo missed a penalty in their last game, as they were held to a 1-1 draw by a resilient Iran side earlier this week. The result saw them finish second behind Spain in Group B.
Portugal were semi-finalists in 2006 and won the European Championship in France two years ago. Portugal manager, Fernando Santos is expected to keep forward, Ricardo Quaresma in the side at the expense of Bernardo Silva, meaning his side will be unchanged from the 1-1 draw with Iran. Santos has no new injuries worries in his squad ahead of this clash. Muslera, Varela, Gimenez, Godin, Caceres, Sanchez, Torreira, Vecino, Bentancur, Suarez, Cavani. Rui Patricio, Cedric, Pepe, Fonte, Guerreiro, Quaresma, Carvalho, Adrien Silva, Joao Mario, Andre Silva, Ronaldo. Kick-off is 7pm Nigerian time.